Hayes’ Madison Eldridge, front, and Groveport’s Melia Walder battle for possession during the first half of Thursday’s non-league showdown in Delaware. 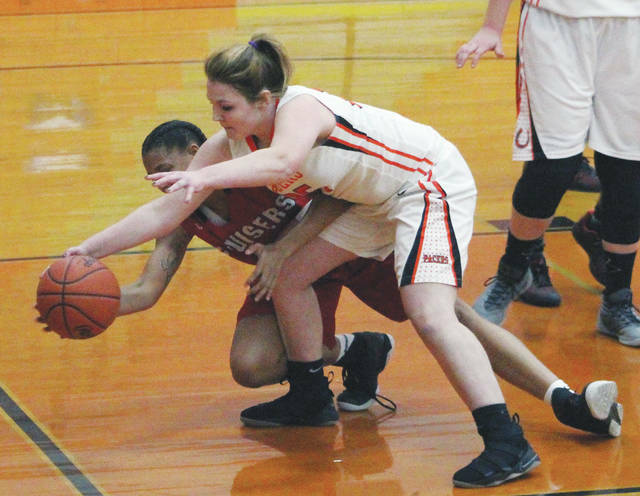 The Delaware Hayes girls basketball team had the law of averages on its side in the fourth quarter of Thursday night’s 41-36 non-league win over visiting Groveport-Madison. Freshman Jordan Lantz broke a 34-34 tie with a pair of free throws to give the Pacers the lead for good with 1:12 left in the game. Teammates Alyssa Griner and Rachael Bourget followed with a pair of free throws as Hayes finished 7-for-8 at the charity stripe to earn its 14th straight non-league victory in the regular season dating back to last season. The Pacers (4-4) struggled from the line before clutch time, hitting just 11 of their first 22 free throws. It was a good thing, too, as the nine fourth-quarter points were all scored at the foul line. Hayes coach Lou Tiberi said they shoot “right around 58 percent” for the season. So, those fourth quarter free throws got them just over their average. Delaware struggled from the field all night, going the first 6-plus minutes without a field goal as Groveport opened a 13-2 lead before Alexis Amabile found Jessica Walker for a basket to make it 13-4 at the end of the frame. “I knew we would have open jump shots. But, if we don’t make shots – we could keep them in the game,” Tiberi said. Lantz, who scored a game-high 18 points, took over midway through the second quarter, scoring Delaware’s next three baskets before a Karli Theis bucket cut the deficit to 19-15 at the break. Katie Smith came up big in the third quarter feeding Lantz on the first two baskets before she knocked down a mid-range jumper to tie the game 21-21. After a Lantz free throw gave the Pacers their first lead since 1-0, Piper Adkins found Smith in the corner for a three to push the lead to 25-21. Delaware led 32-27 at the end of the third. Groveport’s Lanie White scored off a Melia Walder steal to start a 5-0 spurt that ended with a Walder driving lay-in to tie the game 34-34 with 1:35 left. Walder finished with 14 points and White and Brooke Reese finished with eight points apiece to lead the Cruisers (2-8). Delaware travels to Franklin Heights in non-league action Saturday afternoon at 2:30 p.m. to close out the year. Also: Detroit Martin Luther King 57, Olentangy Liberty 54.